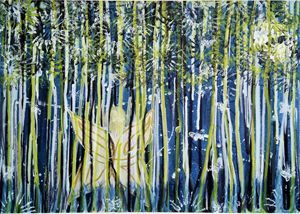 Annabelle the Angel is painted on a 20" x 30" canvas. 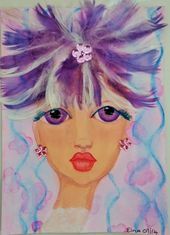 This gorgeous angel is the first in a series called Elna's Angels. 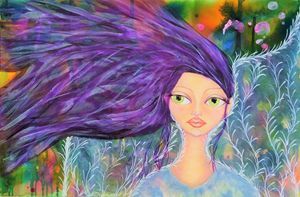 The is a mixed media portrait of an angel with long flowing purple hair and beautiful diaphanous wings on a bright colourful background. That’s how I describe my art. 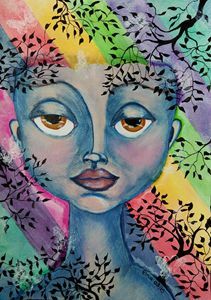 My name is Elna Vlok and I’m a mixed media artist from South Africa. I have always been drawn to whimsical and fantasy art, but as I have had no formal art schooling, I have taken the exciting, sometimes frustrating, but never boring route of teaching myself as I go along. Drawing was always something to be feared, but once I tried and realised that it wasn’t quite as impossible as I thought, and that I could do enough to get me started, a new world opened up to me and at last I was able to begin creating “Elna’s Girls”, the gorgeous big eyed girls that I had dreamed of doing, in a style all of my own, and is now being recognised as such. 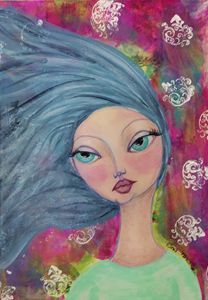 The bright colours and myriad creative possibilities of Mixed Media and the Whimsy and Fantasy movements have played a very big part in my developmental journey as an artist and in July of 2013 I embarked on this very satisfying new adventure of creating “Elna’s Girls”. When I start a new artwork I have no idea of what I want to do, or how it should look, except for the fact that I want to create a big eyed girl. 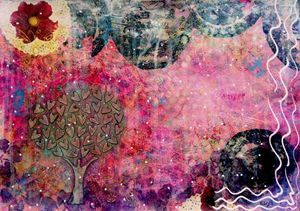 The rest I totally give over to intuition and what feels right in the moment. 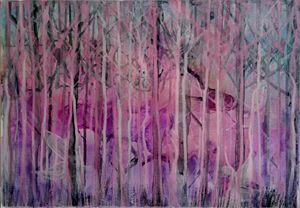 I believe that we all develop a distinctive style and colour palette as we grow on our creative path, and for me it has been girls with big soulful eyes and a palette of pinks, blues, purples and greens. 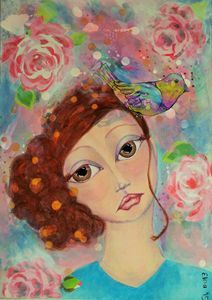 I also like to do interesting things with my girls’ hair, like covering their heads with feathers or flowers instead of painting hair, as this affords me endless opportunities to create beautiful and interesting works of art which really stand out from the rest. 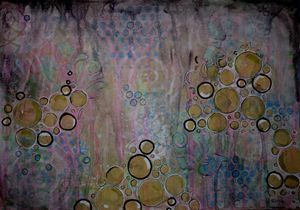 Over the last two years I have been very privileged to have been the featured artist on a great art website called The Art Colony. 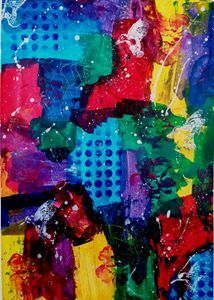 I also won the wonderful title of “Artist of the Day” on another art site called Artradio, which gave me wide exposure to artists and art lovers who might not have seen my work otherwise. 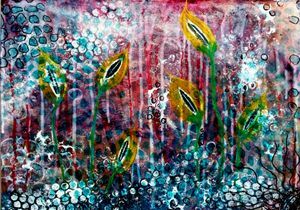 Being very active on social media and having access to the World Wide Web has enabled me to sell my artwork worldwide and I now have art on almost every continent. 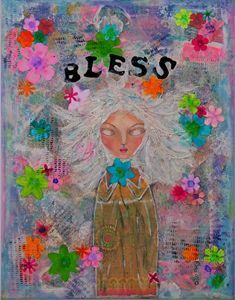 I am currently working on a series of girls called “Elna’s Angels” where I am attempting to do 5 or 6 large canvasses showing my rendition of angels. This is to remind us and the world at large that there is a lot of good surrounding us. We aren’t always aware of this, but it is always there to help. Everything is possible if we just believe in our own abilities, and that we can create, or be or do anything.